Improved processing and basecalling of traces with large peaks. Change to the use abi limits module to make the minimum base 1 rather than 0. This fixes a display bug for traces within the ABI Sequence Analysis™ software. Updated list of supported sequencing run conditions. CodeMeter™ runtime updated to 6.30. One of the new features introduced in PeakTrace 6.40 was secondary noise peaks. The setting is unusual in that it actually make the traces appear to be of lower quality than the result normally provided by PeakTrace. This setting introduces artificial secondary peaks under the primary peak proportional in height to the percentage value entered and the height of the primary peak. For example, using a secondary noise peaks value of 5 adds secondary peaks that are 5% of the primary peak heights under every primary peak in the trace. Adding secondary noise peaks can be useful if you wish to give your end users a trace file that looks much closer to that which would be output by the KB Basecaller. Figures 1 to 3 show examples of how the secondary noise peaks option works. Figure 1 shows an original KB Basecalled trace at ~base 400; Figure 2 shows the same trace after PeakTrace basecalling with a secondary noise peaks setting of 0 (i.e. off); Figure 3 shows the same trace, but using a secondary noise peaks setting of 5 (i.e. 5%). Figure 1. KB basecalled trace. Figure 2. PeakTrace basecalled trace with default processing values. Figure 3. PeakTrace basecalled trace with a secondary noise peaks setting of 5. While it is immediately obvious that the standard PeakTrace basecalling (Figure 2) is far superior to that provided by KB (Figure 1), some users are concerned that the default PeakTrace basecalled traces look “too good” to be real. While we think this is an unnecessary concern (after all nobody complains that their dinner tastes “too good” and they wished that it tasted worse), we do understand that some of our customers want to provide their end users with the superior basecalling of PeakTrace with a trace that looks very similar to what KB generates. The secondary noise peaks setting provides a simple way of degrading the trace output so that PeakTrace basecalled traces look like KB basecalled traces, while still providing the same base and quality score improvements that PeakTrace offers. It is advisable to not use a secondary noise peaks value over 10. Using a large value will create a trace with a very poor appearance and end users may mistake the secondary peaks as true mixed peaks. This is one setting to use with caution. New Feature. Extra baseline option (-xb) for improved appearance of trace files. New Feature. Secondary noise peak option (-nsp) to add peak noise to the traces. Improved trace processing quality and speed. Unsupported run types now output .seq and .phd.1 files based on the KB basecall if these file types are requested. Trace types which do not contain quality scores can now be output in ab1 format (without quality scores) if either clean baseline, extra baseline, or extra normalization is selected. If the N base threshold is set to 1 or 0 and the fuse basecall value is greater than 0, then any N bases from the original KB basecall will be set a quality score of 2. Requires CodeMeter runtime 6.20 or higher (provided). We will be releasing Auto PeakTrace 6.30 early next week as soon as the final testing is complete. This command will list the serial number of the CmContainer which you will need to generate the PeakTrace License Request file. 3. Email this file to Nucleics (or your local supplier). New Feature. User settable PCR trim base. New Feature. Command line option -qr to report the QualTrace III license information. New Feature. Command line option -lc to report the PeakTrace license code. New Feature. Command line option -bd to report the PeakTrace build date. Upgrade of Codemeter Runtime minimum requirement to 6.10. All N bases now have a quality score of 2 rather than 0. Sporadic traces with all N bases should no longer be generated (bug fix). Other bug fixes and internal enhancements. If you are having problems getting the Auto PeakTrace or the Linux PeakTrace software working, you may be requested to generate a cmDust file. 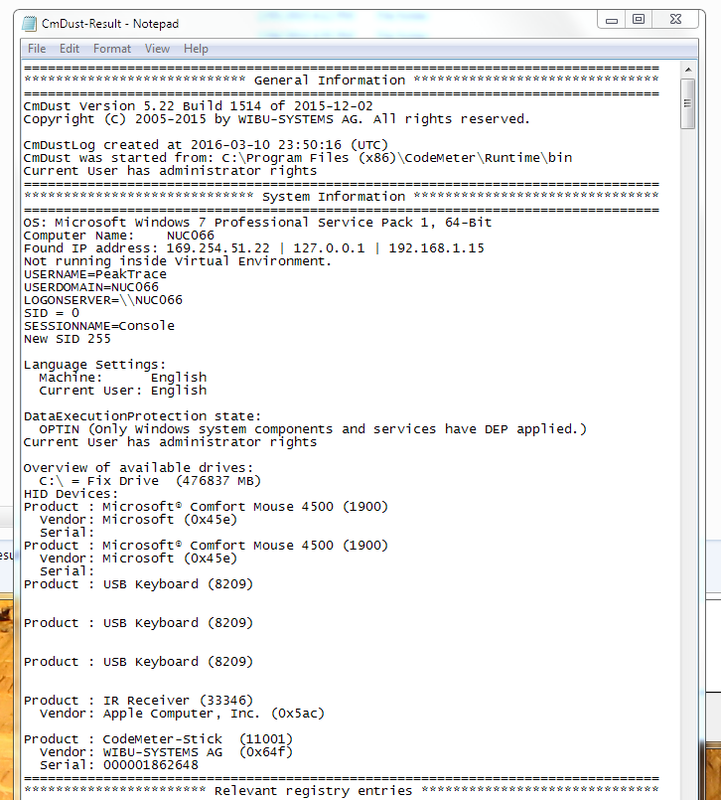 This file is created by the cmDust utility, which is installed as part of the CodeMeter Runtime. The cmDust file provides us with a diagnostic of your system and can help us identify the cause of the problem(s) you are experiencing. 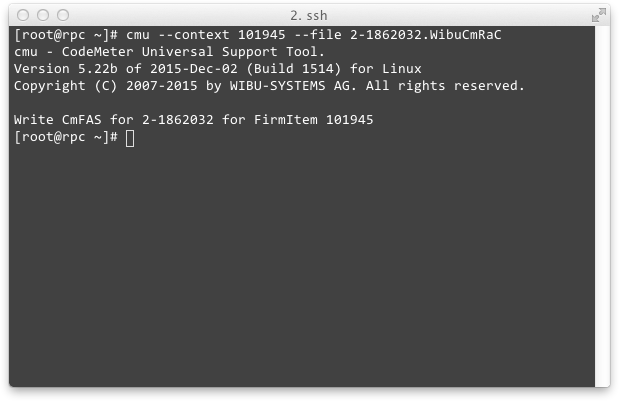 If requested by Nucleics (or your local supplier) to generate and send a cmDust file, these are the steps for both Windows and Linux. 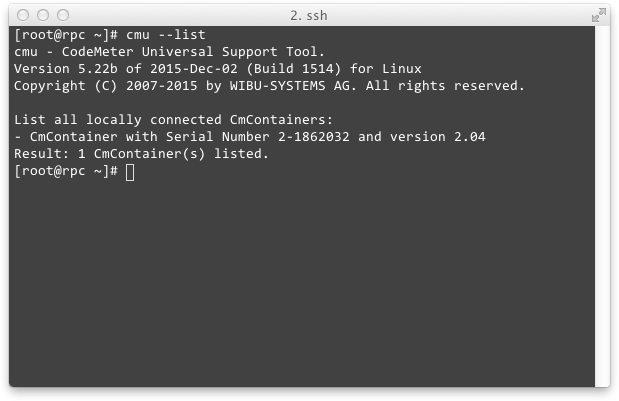 Open the cmDust utility. 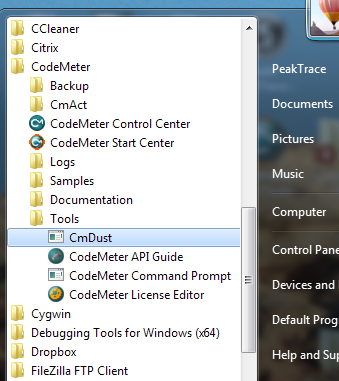 You can find it in the CodeMeter Start Menu folder, under Tools. Once selected, cmDust will generate a text file called cmDust-Result in your current User folder. Email this file to Nucleics (or your local supplier). 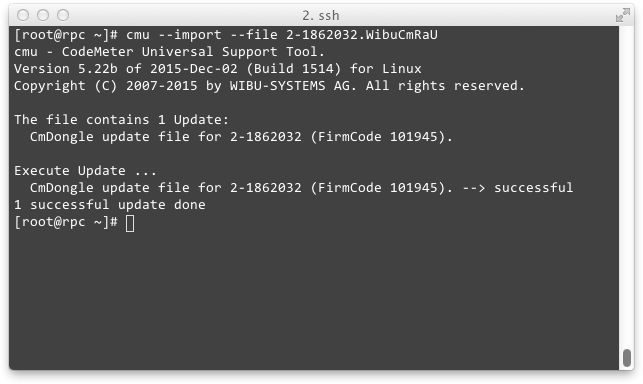 Open a shell on the Linux machine which has the USB key. We have updated the layout of our software downloads page. Previous we all software updates were on the same page for the different versions of PeakTrace, but we found that many customers were confused as to which version they should download. To try and make this process less confusing we have split the downloads pages into an PeakTrace RP Downloads page and a PeakTrace:Box Downloads page. These pages are also direct accessible from the Support menu. New Feature. Bubble spike removal. New Feature. PeakTrace basecalling with improved KB Basecaller™ trace processing fall back. New Feature. User controlled extra smoothing of traces via the -xs option. New Feature. Limit trimming to the 3′ end of the trace only via the -ts option. New Feature. Manual control of the skip short base threshold. New Feature. Set use of the edited basecalls within the trace. New Feature. Picket Fence trace output. New Feature. Simple mixed basecalling. Improved fuse trace of repeat sequence regions. Improved fuse basecall of repeat sequence regions. Improved basecalling of mixed peaks.